Presidents get judged in many ways, and the expectations we place on them, and the criticisms we level at them, aren’t just based on the records of their contemporaries or their predecessors. We see qualities represented on the big and small screen that we wish were represented in real life candidates. Fictional presidents and the ideas they represent give us a framework to explore the office of presidency that often transposes the hardships of past presidencies into a more contemporary setting, and then with some analogs of an existing President we get to play out how they might cope in such a situation. It’s kind of like the social fiction equivalent of design fiction – test run the sitting President through strange situations and seeing how that might pan out. I believe that we tell stories about things to work out how we think about them – different beliefs and party affiliations deriving from the stories we are telling ourselves about the world. Martin Sheen has been the best of Presidents and the worst of Presidents. The same man let the missiles fly in Dead Zone, and then showed us what a great President could be in The West Wing; he has also played JFK as well, so he has all the bases covered. The West Wing is one of the most in-depth dramatic looks at a presidency and how the whole machinery works committed to film thus far. Of course Sorkin’s bias affects the kind of stories that are told, but it does feel like a genuine exploration of the subject, and a great fictional demonstration of what an ethical and intelligent president might achieve. Morgan Freeman in Deep Impact was as reassuring and great as President as he was as God in Bruce Almighty. A President in times of adversity, such as the threatened extinction of the human race, is also going to be called on to display qualities a little different to a President under normal circumstances. 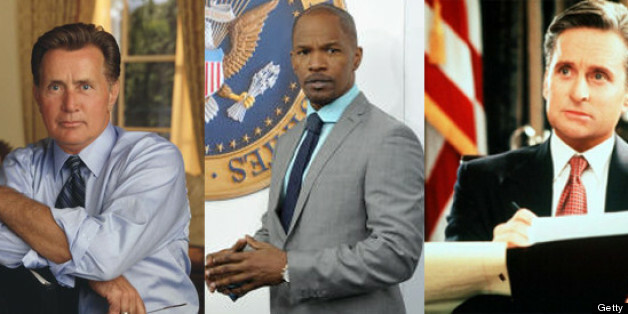 Fictional Presidents impact on how we think about real politicians derives partly from their usefulness in allowing us to explore both the dark side of all that power, and the positive side. What ifs are always fascinating. John Travolta’s turn as a fictionalized Bill Clinton in Primary Colors definitely didn’t do anything to hurt Bill’s image. Knowing that President Josiah “Jed” Bartlet was loosely based on Clinton, and that in the series he was such a good President was a real vote of confidence. Obviously not everyone is going to agree with their policies, but it can strangely serve to humanize someone and make them realer to the audience. There are other fictional politicians too who provide great frameworks within which to explain the machinations that occur in politics – Alan B’Stard really nailed the Tories, Francis Urquhart and Frank Underwood in the UK and US versions of House Of Cards have really captured the imaginations of the public, and hold up a mirror to the current viewpoints of what people think of their politicians. Bulworth used satire and comedy to explore some serious issues, as did Bob Roberts, pointing out the failings of the administrations that existed at the time of filming. For me two big ones were the Presidents in Warren Ellis’ Graphic Novels Transmetropolitan – The Beast and The Smiler. The Beast gives us the Nixon to Spider Jerusalem’s Hunter S. Thompson, and he is definitely in the mold of the old kind of corrupt politician. The Smiler (Gary Callahan) is slicker, and calls to mind Tony Blair in his spin doctor spun hey day, where smiles and sharp suits and well stage managed press conferences couldn’t help but hide what seemed to be something of a hollow core. Ellis really digs in and gives you an idea of how and what the Presidency can be used for, and how the personalities and personal agendas of the Presidents can impact on the country through holding that office. Adam Sutler in V For Vendetta is Alan Moore’s satirical dig at Thatcher, some of her right wing tendencies and more out there ideas taken to the extreme (though scarily not that far beyond what she proposed). It is a connection that hits those of a certain generation right between the eyes, but may be lost on some viewers, who probably just take away from viewing the movie that the government is fascist and possibly some kind of Nazi analogue. Fiction is often a great way to parse the current sociopolitical climate in a way that non-fiction can’t – you can address worries, you can explore possible outcomes, and you can offer a commentary on a certain way of thinking that, if done well, side-steps libel and all those other awkward things that a direct journalistic piece can run into. When they were filming the West Wing the show-makers were given unprecedented access behind the scenes, which is interesting given that they were portraying a very Clintoneque President during the Bush era. It isn’t hard to see which Presidents are being drawn from to inform the fiction, and candidates like Trump have already made it into The Simpsons in that role. It’s great PR if you have become someone that popular culture is having a dialogue about – even if it’s bad it means that you are interesting and you are drawing attention. I don’t know of any Presidents actually courting this kind of thing actively, but it’s going to happen; they will find themselves represented some way in the culture that surrounds them or succeeds them. Might it be something they would consider? Seeding the world with your ideas via a fictional version might be a pretty subtle and smart idea. President Obama has been in a lot of comics, and they haven’t all been straight up biographical stories. He was endorsed by everyone from Spiderman to Savage Dragon, to Ash from The Evil Dead. As early as 2007, President Obama was being compared to a comic book hero by David Ehrenstein from the LA Times. Fictional Presidencies, or fictionalized ones, can give a gauge of where the current populace view their politicians as sitting, and whether they swing towards hopeful narratives or doom-laden apocalypses might give a very good indication of how people see their futures with said President. I think it’s likely to remain a reactive thing rather than a proactive interaction, as it could be easily mistaken for self aggrandizement. If someone pays you that compliment though, I can’t imagine many people not being happy. Obama used the comparison to Superman in one of his speeches: “Contrary to the rumors you have heard, I was not born in a manger. I was actually born on Krypton and sent here by my father, Jor-El, to save the planet Earth.” Wish fulfillment, satire, and possible future PR or idea dissemination tool?